Shop Evans EMAD Heavyweight Clear Bass Drum Head 22 Inch from AMS and enjoy Fast & Free Shipping. The EMAD Heavyweight bass batter head redefines the sonic capabilities of the acoustic bass drum. Combining two plies of identical 10mil film with the groundbreaking EMAD system, the EMAD Heavyweight is the thickest, most durable bass head in the Evans product line. With the EMAD system, additional muffling isn’t necessary. Two different muffling rings are provided in order to adjust sustain and tonal focus. If maximum low-frequency response with accentuated attack is the goal, the EMAD Heavyweight will make it happen. Product seems to be the real deal. I just put all new heads on my set. This head sounds excellent!! One of the best innovations to drums in a long time. These heads are quickly becoming the new "standard". The ability to change the sound and feel of you kick, in seconds, is fantastic. The ability to go back to the previous sound in just a few seconds longer is a nice bonus as well. Evans is the best IMO. 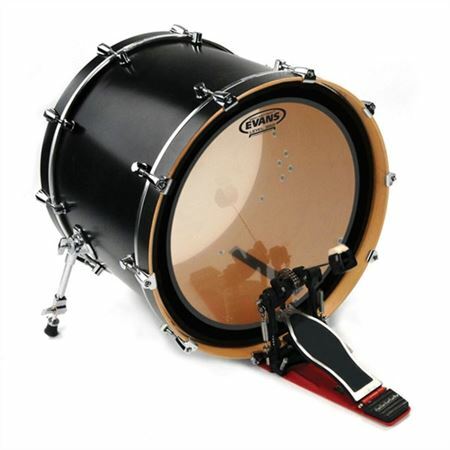 The new technology heads the Evans EC360 is great from the 8" through the 22" bass. Nothing else needed like a bass pillow or snare / Tom gel. Great sound.